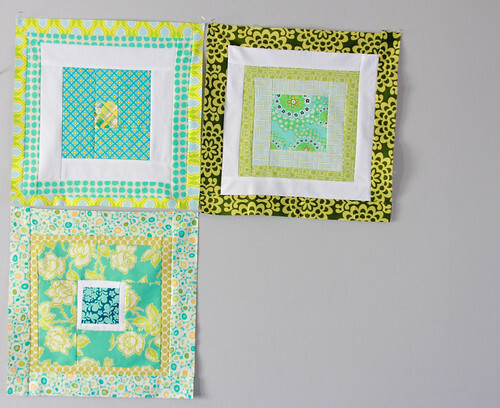 I am starting on my Cal King Quilt since I wanted to make something for me today. 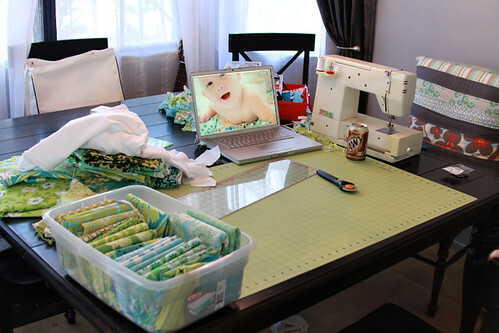 I still don't have a table for my sewing room so I am back to sewing on the dining table. I figured out the dimensions and the size of each block 19.5" so when I sew them all together they will be 19". I am following the blocks that look like Drunk Love by Denyse Schmidt. I don't have the pattern so I am just winging it myself. Basically making squares within squares. This color pallet is just amazing and has always been my 2 favorite colors. I just love green and blue was always my favorite growing up. Well I have 3 down and 53 to go. I am not in a hurry since I will have to save some money to send this out to get quilted and right now all my money is going to fixing up the house but there is only so long I can go without having something on my bed. I love your blocks! This will be a gorgeous quilt! Enjoy the process of making something just for you. Green and blue are so pretty together--yes indeedie!!! I love those colors too! I really should get going on a quilt for my bed. Beautiful choice for color combo--James Taylor described it perfectly “Deep greens and blues are the colors I choose.” I love what you are doing with them.